I finally got the opportunity to see Harley-Davidson’s new motorcycle—the Street 500—up close and in person at the 2014 International Motorcycle Show in the Chicagoland area. 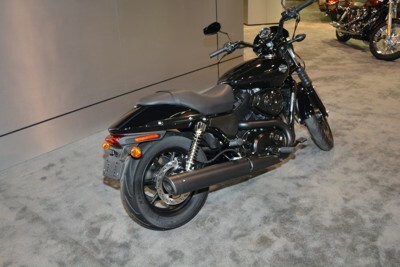 There it was, in Harley-Davidson’s designated floor space. Only the 500 and not the 750. Yep, I got to sit on it, touch it and to be completely honest with you, I did some fondling. I spent a lot of time researching these new motorcycles on the Internet and looking at the pictures. But nothing beats the experience of the light energy bouncing off of it going into my eyes and being plastered in the back of my brain. I’m no expert in motorcycle marketing, but I really think these two new motorcycles are going to give Harley-Davidson an opportunity to penetrate other manufacturers’ similar product markets. This is definitely a rogue move for Harley-Davidson. A lot of people will suffer undue pain because these motorcycles are currently manufactured in India. This isn’t the first time that Harley-Davidson has had motorcycles built in other countries and glued on their nameplate or spray-painted it on the tank. Harley-Davidson wants to be a global company and manufacturing “stuff” in other countries is just part of the framework. Well, let’s start with the engine, it definitely looks a lot like a scaled-down V-Rod engine. I’m assuming it is because that seems to be a proven technology that has served Harley-Davidson well. 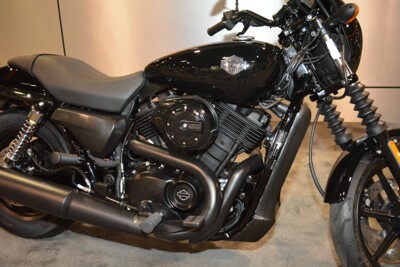 It’s a V-twin with a 60 degree spread, four valves per cylinder with water flowing through its veins to keep it cool. It has a name and it’s called “Revolution X.” Currently the Revolution X engine will come in two sizes a 500 and a 750. It definitely looks good in the frame. The engine is all blacked out. The Street 500 had one disk in the front and another disk in the back to provide the deceleration for these two motorcycles. The rear wheel is rotated by a belt drive from the engine. 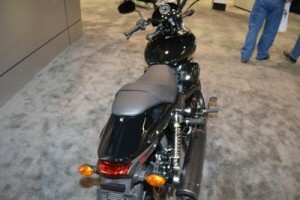 The exhaust system is a two into one on the right side of the motorcycle and it is also blacked out. The rims look to be casted with no special design in mind. The air cleaner seems rather large probably to keep the engine from suffocating. This baby comes equipped with Michelin tires, a 140 x 15 in the back and a 100 x 17 in the front. I don’t know if this motorcycle has ABS. I guess I should’ve done little research before I started writing this, but that would require extra work. I’m pretty sure that if this model doesn’t have ABS future models will. I know the EU is going to require motorcycles to have ABS braking systems in 2016. No traction control on this baby. None of that electronic fancy boy crap to muck up the riding experience. 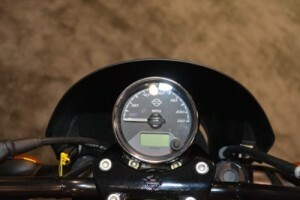 Standard controls on the bars include the start button, kill switch and turn signals. The key switch is buried under the uneventful speedometer. I’m going to guess that the speedometer provides very little information to the rider. But there’s a strong possibility that I’m ill informed. 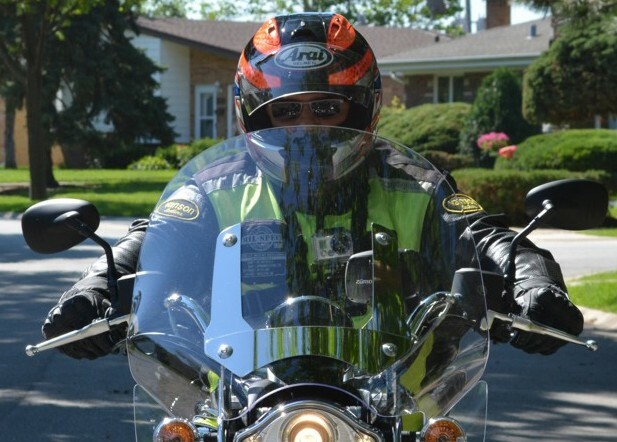 I’m a big fan of having a tachometer, so I hope it’s their when I get to ride his baby sometime in June. I do have a few complaints about this motorcycle. Part of the wiring harness near the back of the motor on the right side is what I would consider somewhat exposed. I definitely see this portion of the wiring harness somehow hidden behind the frame and future models. Some of the welding looked a little crappy. I especially didn’t like the weld job that attaches the foot brake pivot point. Definitely not cool. I’m sure these things are minor production problems which will be corrected in the future. While at the show, I did my own market research. Stood by the Street 500 and watched how many people got on and off it in about a 15 minute time frame. Seven people took their time out from the show to sit on the motorcycle and turn the throttle, squeeze the brake and clutch levers. A few bounce around on the suspension and twist the handlebars back and forth rubbing the front wheel into the carpet. One guy went as far as to adjust the mirrors. That behavior was somewhat confusing. I’m guessing he was actually projecting himself riding the motorcycle. Sure why not. I’m going to guess that if I was born 35 years later, I would be riding one of these motorcycles. I definitely would choose the 750 over the 500. It is by no means perfect, but for a 20-year-old kid without a lot of cash, it offers the opportunity to ride the ultimate branded motorcycle. 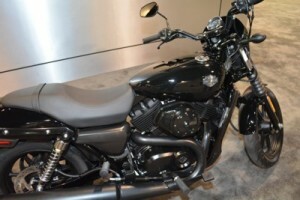 These two motorcycles will give a lot more people access to becoming part of the Harley-Davidson tribe… a very good thing for Harley-Davidson because their current demographics seem to have one foot in the grave. I’m going to guess these vehicles are very important to Harley-Davidson’s global sales strategy. I’m sure Harley-Davidson has been drooling about getting some of the market share of the 10 million motorcycles sold in India each year. Failure to participate in this market will sooner or later devastate the company.